An efficient online invoice tracking software plays a very important role for any organization as well as consultants and freelancers in effective dealing of client billing and payment management. Although there is a handful of online invoicing software available in the market, most of those are inefficient and complicated to use. While dealing with large number of clients, one needs to have a flexible and intuitive online billing software that allows users to generate and deliver online invoices timely, track all paid and overdue bills, notify clients for late payments and keep record of all payments. AccountSight offers all those functionality and more. AccountSight being an online time and billing software can track employee timesheets and project expenses and create online invoices based on all dedicated billable hours and expenses incurred in the project. 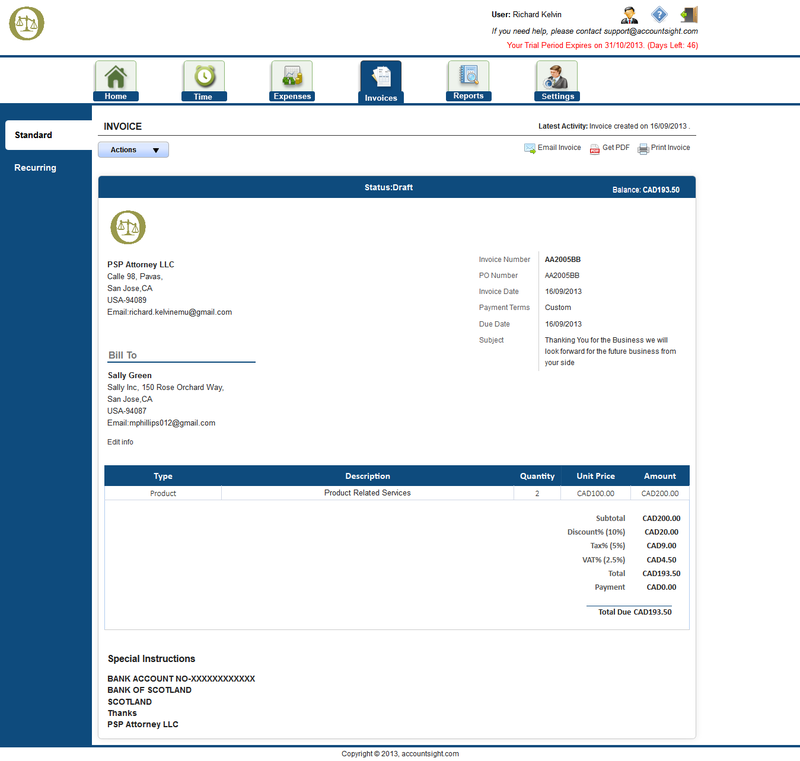 In addition to that, AccountSight has the exciting feature to generate manual invoices. Apart from weekly time sheets and expenses, sometimes unscheduled irregular costs are incurred in projects which are not recorded by employee timesheets and expense sheets. AccountSight has the provision to separately create manual invoices to register this kind of costs and activities. Users can configure manual invoice settings before start sending online manual invoices to clients. On the basis of client profile and requirements, users can customize tax rates, discount level, currency type, invoice template and other options. In addition to that, AccountSight online invoicing software is flexible enough to allow users process manual invoices without any prior configuration. Users can directly enter data or change the default data in all the fields while generating manual invoice. While selecting a client or cost item, users can directly choose from the drop down list of existing clients or add a new client or item manually. No prior setup is required for that. It’s that simple and easy! AccountSight’s smart stylish colorful invoice format is another plus for the users. To meet various clients’ various business requirements and color themes, AccountSight online invoicing software provides a wide range of colored invoices to choose from. This option enables users to satisfy clients with professional business invoices. Does your invoice tracking have all these exciting features? Don’t worry! Use AccountSight! Register to AccountSight online time and billing software now to use the 30 days FREE trial! No credit card is needed. Simply fill up the form and start using it instantly!